Google might release Nexus Two next month? After the success of Google Nexus One, Google is now going to launch its Google Nexus Two Smartphone. The inside news from Google is that they are hard at work on the successor of the Nexus One, dubbed the Nexus Two. Although not too much information has been revealed about the Nexus Two, the tipster has revealed Google is going to release it within the next month. With other rumors of Android 3.0 in the wild, running on what looks to be the Nexus One, which could actually be the first image of the Nexus Two, shows the device running a new firmware with a piece of paper covering the top of the phone. 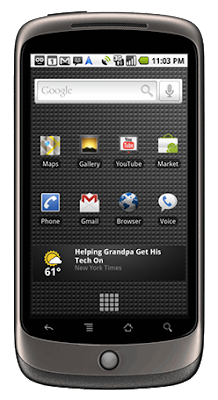 Nexus One may not have sold a lot of units, around 135,000 units in the first three months, and was even dropped by Sprint due to poor sales and because its bigger competition, the HTC EVO 4G, was about to debut for release. As we mentioned earlier about Top 5 Android Phones the HTC EVO 4G was on top chart in previous week. Google stopped shipping the Nexus One earlier this month, closing its online store so consumers couldn’t purchase the phone directly from the company themselves. According to our source, the Nexus Two is set to release next month, but no pricing, date or technical specs were released, but Google is secretly working on the Nexus Two. One thing is for sure, Google will need to make this release a good one if they want to compete with Apple’s iPhone 4, Microsoft’s Windows Phone 7, and the HTC EVO 4G.